The Today Show team shared three ways to reinvent your Thanksgiving menu, including a Sweet Tea Brined Deep Fried Turkey Breast with Sriracha Butter and Bacon Cornbread Stuffing. Want more? Try Achiote Turkey or Sausage and Rice Stuffing. Al Roker talked with Suzanne Vizethann, executive chef from Atlanta’s Buttermilk Kitchen. Sweet tea is a great idea for a unique brine. I wonder how it would taste. Remember to completely pat the turkey dry after brining but before frying. In a large container (~20 quarts), combine sugar and salt with hot brewed tea. Squeeze lemons slightly while adding them to the brine. Chill before adding remaining ingredients. Fully submerge raw turkey in the brine for 12-24 hours, refrigerated. Lay a sheet of plastic wrap on a prep surface for the Sriracha butter. Combine Sriracha butter ingredients in a stand mixer. Once mixed, scrape down the sides. Then mix for another 30 seconds. Remove butter and place it on the plastic wrap sheet. Shape it into a log and wrap it tightly. Chill at least one hour before using. Pat the turkey dry using paper towels. Let come to room temperature for at least half an hour while you pour oil into an electric turkey fryer and heat it to 300 F.
Fry turkey for 30 minutes at 300 F. Then remove the turkey and raise the fryer temperature to 350 F. Fry for 10-15 more minutes, to an internal temperature of 150 F. Let rest for 15-20 minutes, during which time it will continue cooking to 160 F.
Fry rosemary and thyme sprigs. Use these and the Sriracha butter to garnish the turkey. For the stuffing, saute bacon on medium in a skillet to brown. Remove bacon and drain the pan. Reserve half the bacon for use in a future recipe. You will need to keep 1/4 cup bacon fat. In the same skillet, saute onions and celery in 1 1/2 tbsp bacon fat for about five minutes. Add rosemary during the final minute. 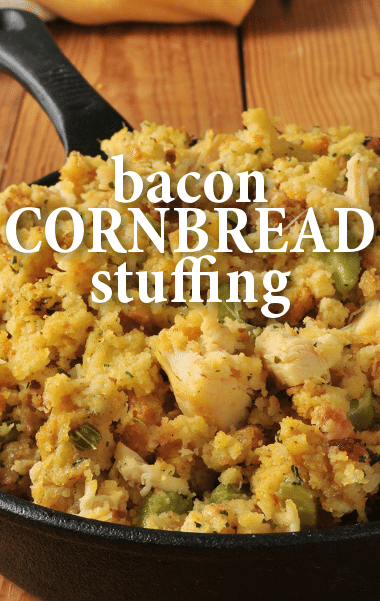 Combine cornbread, white bread, veggies, and half the bacon in a bowl. Preheat your oven at 350 F.
Pour broth and 1/4 cup fat over the stuffing. Bake 45-60 minutes.